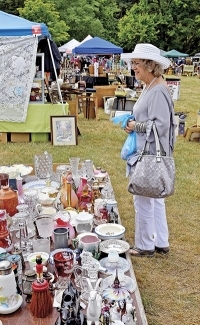 The Westlake Historical Society will be hosting the annual Antique, Vintage and Craft Show at the Clague House Museum, 1371 Clague Road, on Sunday, July 15, from 9 a.m. to 4 p.m. The rain date will be July 22. This is our largest fundraiser of the year, which supports the Clague Museum’s utility costs, insurance, refreshments and our many programs. The show will have 25 crafters and about 30 antique dealers. We will have two animal rescue groups (cats and dogs), food booths and refreshments. The museum will be open all day after 10 a.m. We will also have a silent auction with quality items, including a night’s stay at a Crocker Park hotel. Admission is only $3 at the gate and kids 12 and under are free. Parking is free. Please support your local historical society! Any questions please call Jan at 440-227-0061.